Music Headquarters on your Droid Bionic is the app named, oddly enough, Music. You can start this app by touching its icon, found on the App menu. Soon, you discover the main Music browsing screen, similar to the one shown in the figure. 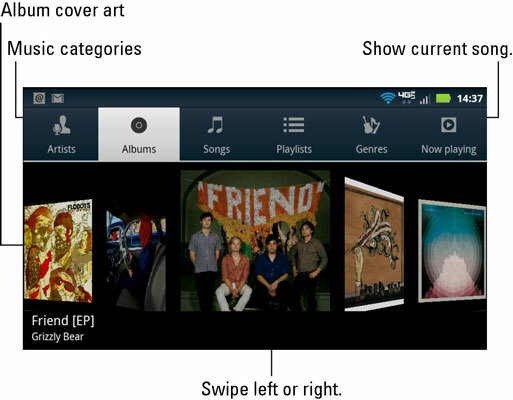 All music stored on your phone can be viewed by category, as shown. Artists: Songs are listed by recording artist or group. Choose Artist to see the list of artists. Then choose an artist to see their albums. Choosing an album displays the songs for that album. Some artists may have only one song, not in a particular album. Albums: Songs are organized by album. Choose an album to list its songs. Songs: All songs are listed alphabetically. Playlists: Only songs you’ve organized into playlists are listed by their playlist names. Choose a playlist name to view songs organized in that playlist. Genres: Tunes are organized by their themes, such as classical, rock, or irritating. Now Playing: This item isn’t a category, but rather a quick link to the currently playing (or paused) song. When the phone is held in a vertical orientation, this item appears at the bottom of the screen. These categories are merely ways that the music is organized, ways to make tunes easier to find when you may know an artist’s name but not an album title or you may want to hear a song but not know who recorded it. Music is stored on the Droid Bionic’s internal storage as well as on the MicroSD card. The size of the phone’s storage limits the total amount of music you can keep on your phone. Also, consider that pictures and videos stored on your phone horn in on some of the space that can be used for music. Album artwork generally appears on imported music as well as on music you purchase online. If an album doesn’t have artwork, it cannot be manually added or updated.